Yeah, I don’t have a cute story to tell about one of my sons involving french bread…sorry. I’m just gonna get to the goods. 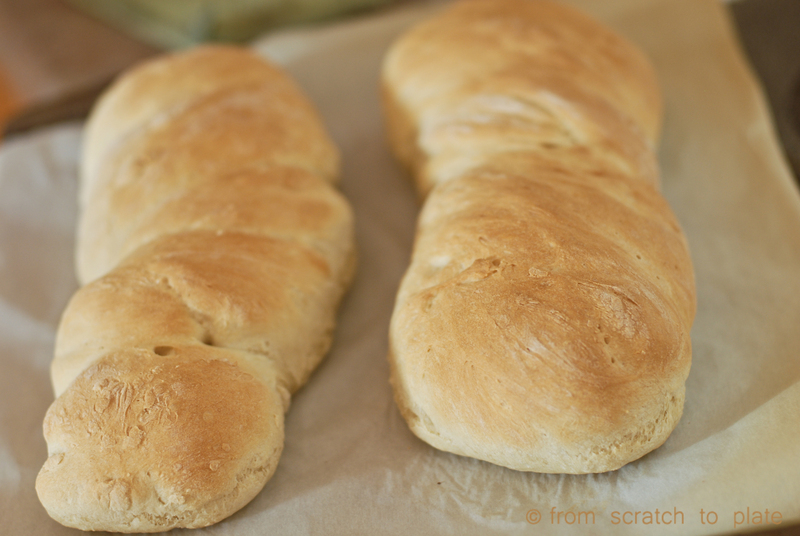 This is the easiest, softest french bread you’ll ever make. 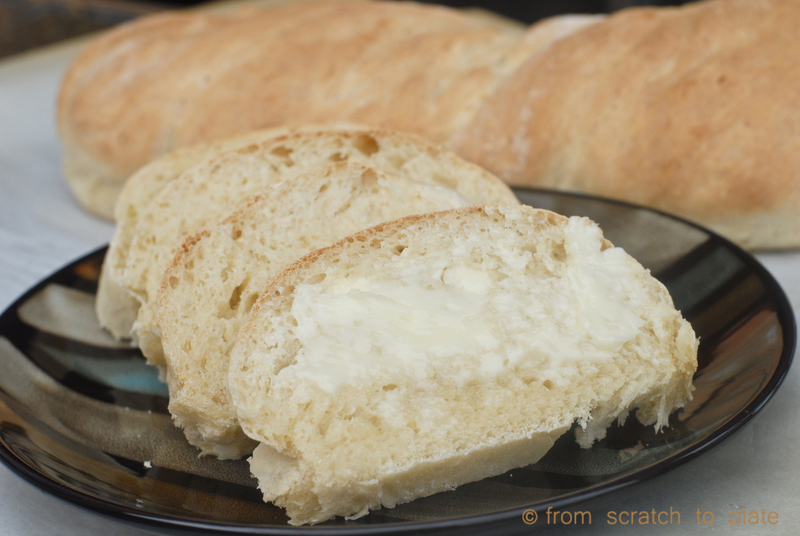 You will never buy a loaf from the grocery store again after making this bread. It’s super soft on the inside and crusty on the outside, exactly how it’s supposed to be. In your stand mixer, with the dough hook, combine the water, yeast and sugar. Add 3 cups of the flour and the salt. Turn on low and mix while adding more flour 1/2 cup at a time. Stop as soon as the dough comes together and forms a ball. Let the mixer knead the dough for 5 minutes. Every once in a while, check the dough. 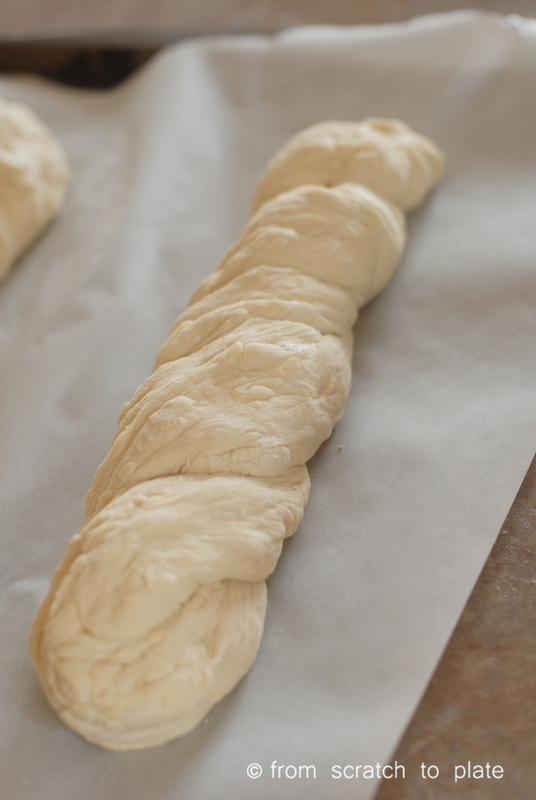 If it starts to stick to the sides, sprinkle a little more flour on the dough until it comes back into a ball. Try to use as little flour as possible. Remove the bowl and set in a warm place until it doubles, about an hour. 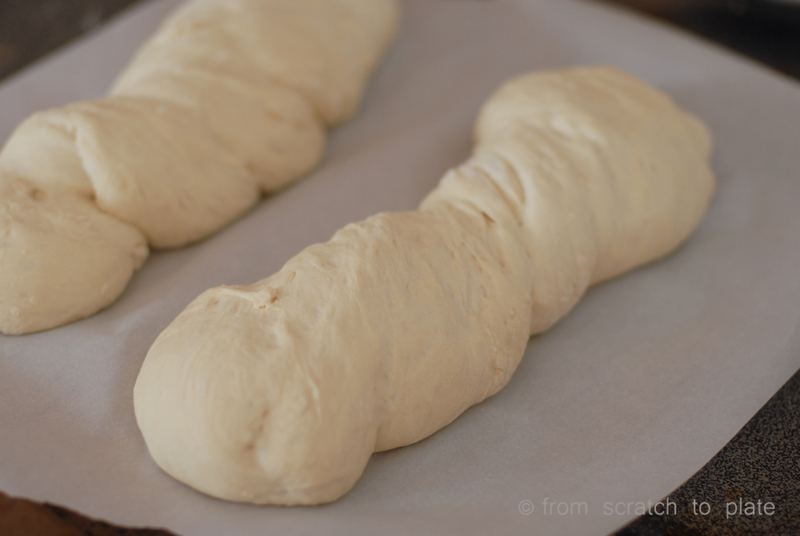 On a lightly floured surface, dump the dough out and cut it in half. 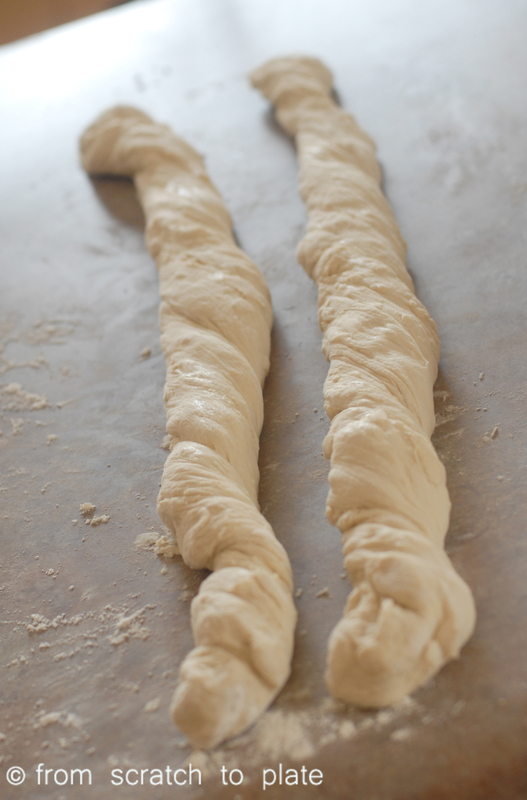 Take each half and twist it into a long strand, like a baguette. Take one strand and fold it in half, twisting it onto itself. Repeat with the other half. Place them side by side on a baking sheet covered with parchment. Let rise for 20 minutes. Preheat oven to 425 degrees. Place a shallow pan filled partway with water on the bottom rack of the oven. Carefully place the baking sheet with the loaves on the middle rack. 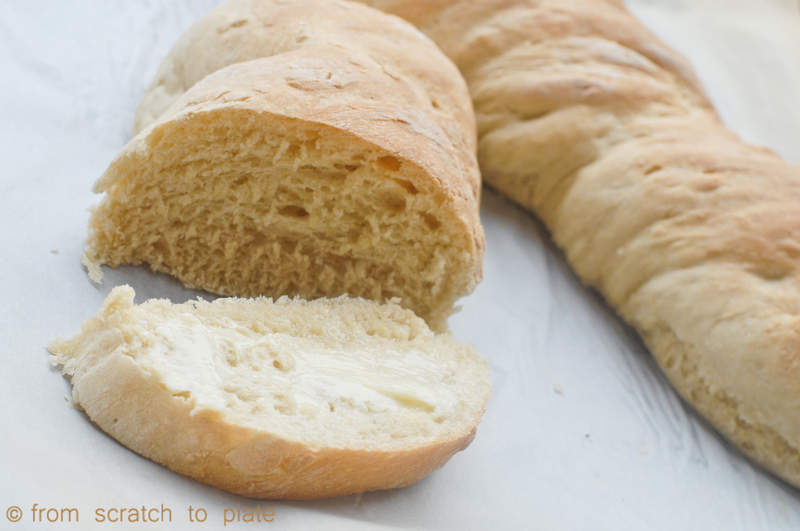 Bake for 15-20 minutes, until the tops are brown and the bread sounds hollow when the bottom is tapped. Let cool before slicing. Is the dough supposed to be super sticky??? Thanks for the zuppa Toscana soup recipe by the way, it was delicious!!! It shouldn’t be overly sticky, but it’s a pretty soft dough. If it’s too sticky, add a little flour. It shouldn’t be too difficult to work with. Thank you so much for this recipe!! It’s the best bread I’ve ever had and so easy to make. I’ve been doing it with half white, half whole wheat flour and also added about 1/2 cup of flax seeds to make it a bit more filling. It was so good I had to make it 3 times in 4 days for my husband and myself because we couldn’t stop eating it! So yummy!